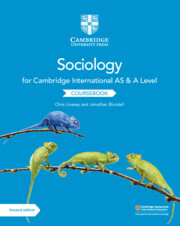 This series has been developed specifically for the Cambridge International AS and A Level Sociology (9699) syllabus for examination from 2021. The ‘What’s the evidence?’ feature introduces vibrant case studies, such as Zimbabwe’s Migrants and South Africa’s Border Farms by Maxim Bolt. Our ‘Think like a sociologist’ feature helps learners to better understand the applicability of studying sociology and how it can be used in their life outside the classroom. For example, students will be asked to think about how their study of feral children and primary socialisation may inform a career in childcare. Sample answers support student understanding of what a ‘good’ answer looks like and helps them to make improvements to their work. ‘Key concept’ questions support learners to develop a conceptual understanding of sociology. Leaners are encouraged to reflect on their tasks and to consider what they can learn from other students with our ‘Reflection’ feature. Exam-style questions offer students plenty of opportunity to practise what they have learnt. Activities throughout give students the opportunity to practise and develop their skills. ‘Key terms’ are highlighted to draw attention to important terminology and support second language students. Learning objectives are outlined at the beginning of every chapter to help learners and teachers navigate the content.